Gas-pump skimming is an old crime making a comeback, and your card may be at risk. Since skimmer devices are almost invisible, they can be difficult to spot. And Bluetooth technology lets the scammer remotely obtain the info it collects from as far as 100 yards away. While EMV-enabled cards are more commonplace, gas stations have until 2020 to update their systems, making them vulnerable. Protect yourself against this hack by learning about card skimmers. Hackers usually outfit the pump farthest from the convenience store with their skimmer. This way, they are out of the range of any security cameras at the shop’s entrance. The hacker places a skimming device on top of the pump’s card reader or inside the pump itself, and then leaves the area. You may seek extra protection by using a credit card or cash to pay at the pump. A credit card lets you easily dispute fraudulent charges. And, depending upon your financial institution, a debit card may not have much purchase protection. The safest payment method might be cash, but remember that it cannot be replaced if lost or stolen. If you don’t like the idea of using cash, you can still protect yourself by being on the lookout for skimmers. If something looks suspicious, don’t use that pump! Use your eyes. Do numbers on the PIN pad look newer or bigger than the rest of the machine? Does anything look like it doesn’t belong? Is the fuel pump’s seal broken? Check the tape. Many gas stations place serial-numbered security tape across the dispenser to protect their pumps. If the tape has been broken, or there’s no tape on the dispenser at all, it’s likely been compromised. Use your fingers. Feel the card reader before sliding your debit card into the slot. Do the keys feel raised? Is it difficult to insert your card? 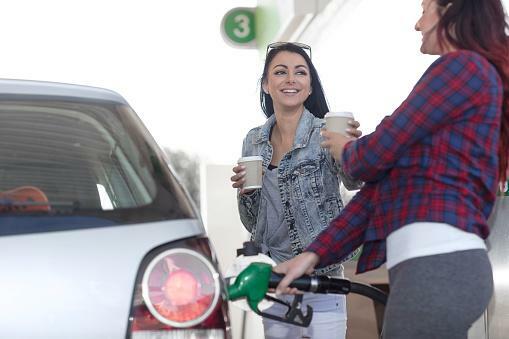 It’s always a good idea to practice general safety when using a card to pay at the pump. Choose the pump closest to the store and always cover the number pad with your hand when inputting your PIN. It’s also a good idea to periodically check your account statements for suspicious charges.